We are realizing that the limiting factor for us in our grazing management continues to be water. We can't change how much falls from the sky (even though we do have influence over how much soaks in – see our Water Management page), but we do have the ability to distribute drinking water for the cattle. We decided to try some alternatives to the big tire tanks that we usually install. Those are wonderful watering arrangements in most situations, but we wanted to try something a little less permanent and with a little quicker setup time. The two rectangular fiberglass tanks are made by Montana Fiberglass. They each hold about 1165 gallons. The tanks are situated on a temporary crossfence. The yellow plastic handles on either end of the guardrail anchor the fence. A strand of insulated wire connects the two fences to carry power from one side to the other. The tanks are fed from a well about 1.5 miles away. We had an existing water line (1.5" PVC six feet deep) buried in the area, so we tapped into it for this setup. The 450 feet between the buried line and the tanks is 1.25" HDPE rated at 160 PSI laying on top of the ground. An Apex XtraFlo valve is installed in each tank. 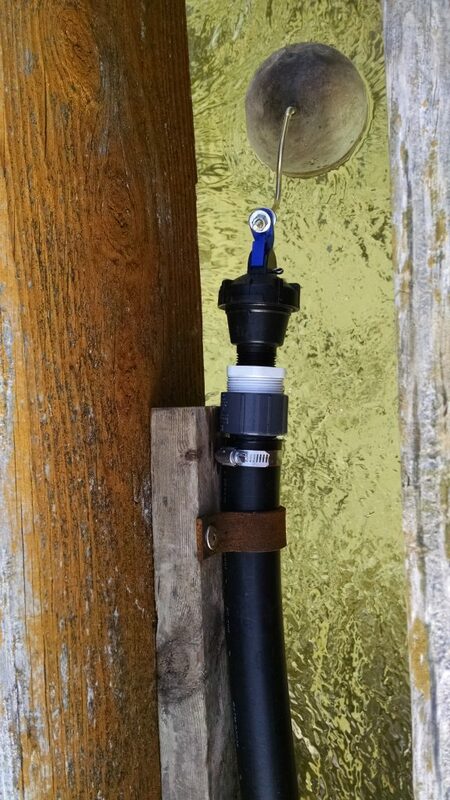 They are a cost-effective valve that requires only 1.5" drop in water level to acheive full-flow. This is intended to be used only for summer use. The above-ground water line and exposed tank valves would not do well with our South Dakota winters. We used guard rail to keep the livestock from crawling into the tank. Angle iron brackets attached the end pieces to the side pieces. There is room for animals to drink on all four sides. The 1.25" HDPE pipe is seen coming into the tanks here. Also, you can see the black insulated wire running along the guardrail. This carries the power across the tank for the electric fence tied on to each side. I did it this way to protect the water from being energized in the event of a break in the fence. Here's another setup I did for our yearlings. It's a smaller herd, thus the size of tank is much smaller. This handles 110 head of yearlings easily with the 5 gallons per minute delivered by our rural water service. The 9' Sioux poly tank holds about 950 gallons. It is fed by about 1400 ft connected to our rural water system by 1.5" HDPE rated at 200PSI. I have a little more work to do here. I plan to install two 90 degree elbows next to the tank so it is not just hanging in the air as it is now. This tank is also regulated by an Apex XtraFlo valve. However, this is a top-fill setup. The brass rod I used did not come with the valve, but it works. Another metal clamp like the one shown here attaches the pipe to the post as the pipe comes over the edge of the tank. There's already been modifications to each of these arrangements, and there's sure to be more as we work out the kinks. It's fun implementing some "rancher engineering" on these projects. About the time we get this right, we'll probably hatch a new idea that might work even better. Update: Both of these setups worked well. The yellow poly tank was used to water 110 yearlings with no problems. 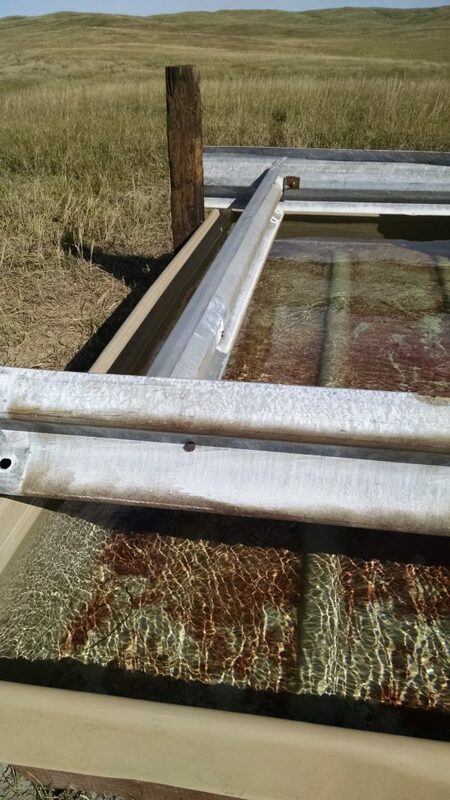 The twin fiberglass tanks watered 240 cow/calf pairs, but we did have some issues with an elbow fitting coming loose. Once that was resolved, it worked well. The lesson we learned was to make sure you have snug-fitting components. I usually have to use a small propane torch to heat up the pipe so it has enough stretch for the barbed end of the fitting to be inserted. If I don't need the torch, then it's likely that the fitting will leak or come apart all together. Next PostNext Award videos are up!